car seat was checked and corrected on Saturday and the crash occurred 4 days later. 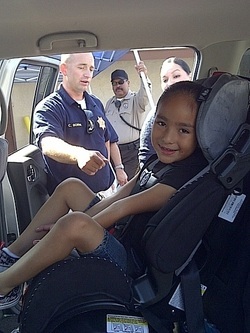 Our car seat check saved Leilani's life. The Lopez car after crashing on a just 4 days after our car seat check. Help us continue to make a difference. Your generous donations give us the ability to continue our life saving services. We're not interested in asking people to give money just for the sake of giving. What we hear from people like you is they're willing to give only when they have a sense of how their donation might be used and why it's important. This type of understanding only develops over time. But for the moment, there's an end-of-year tax deadline looming. If you want your donation to be tax-deductible in 2017, you must make your gift by midnight on December 31st. Every dollar you contribute to our causes will enable us to expand our programs and save more lives. How many of you were involved in crashes or near misses due to cell phones, texting, or other distractions caused by drivers?